Goal Kickers – Hall 3, Clements 2, Wilkinson 1, Baxter 1, Hancock 1, Manteit 1. Best Players – Hall, Clements, Baxter, Taylor, Dale, Clayton, Manteit, Davis. 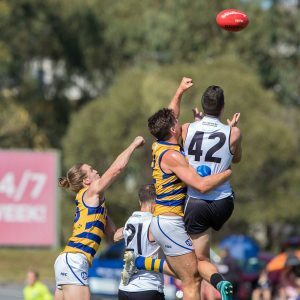 Southport have fallen to third on the NEAFL ladder following a close loss to arch rival Sydney University. In a brutal encounter which saw numerous players referred to the Match Review Panel, it was the Students who finished stronger and came out on top. An eventful first term saw a scuffle prior to the first bounce, some brilliance from returning key forward Josh Hall who kicked the first two goals of the game, a great goal from veteran Josh Baxter and an unfortunate knee injury to small forward Charlie Ford. The intensity was finals like and our boys were up for the battle. The goals dried up in the second term until Uni’s Jacob Derickx kicked truly at the 15 minute mark, which was answered immediately by Josh Hall in great fashion. A thirteen point Southport lead was eroded in the space of a minute through some poor discipline which saw Uni goal after what was described as a “Bonney special” right on half time. Tom Wilkinson was the only goal scorer during the third term following an advantage call after Hancock was felled in a marking contest. The three quarter time lead was only six points and we were facing the last quarter kicking into the breeze. Sydney Uni goaled at the six minute mark to take the lead courtesy of a 50 metre penalty. Three more Uni goals for the quarter were only answered by Rob Clements’ second goal at the 26 minute mark. We were gallant but eight goals to four after quarter time told the story.